Emmanuel Mudiay was once a top prospect at the point guard position. At just 19 years-old, he possessed a superior physical profile compared to his peers and showed flashes of impressive athleticism combined with what seemed to be terrific playmaking ability. Denver brought in — and rolled the dice — on who they thought would be the future point guard of the Denver Nuggets when they selected Mudiay with the seventh overall pick of the 2015 draft. Now — just two years later — things are very different. Matt Moore recently published a story containing some truly damning numbers about Mudiay. Rarely — if ever — does net rating tell the entirety of a story. Sure, we can pick up on some important trends, but a subsequent investigation into the context of these numbers is typically required. As Moore pointed out: the case of Emmanuel Mudiay is a glaring exception. The article highlighted the individual net rating of every player on Denver’s roster. 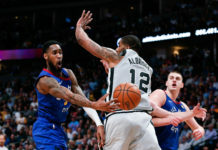 At that time, the Nuggets were outscoring their opponents over the course of 100 possessions when literally every player on the roster was on the court—so long as Emmanuel Mudiay was not. When Mudiay was on the floor, every other player posted a negative net rating. This is as clear as it gets: Mudiay is holding the Nuggets back. Nuggets’ fans are well aware of the tendencies that have prevented Mudiay from turning the proverbial corner in his still somewhat short NBA career. 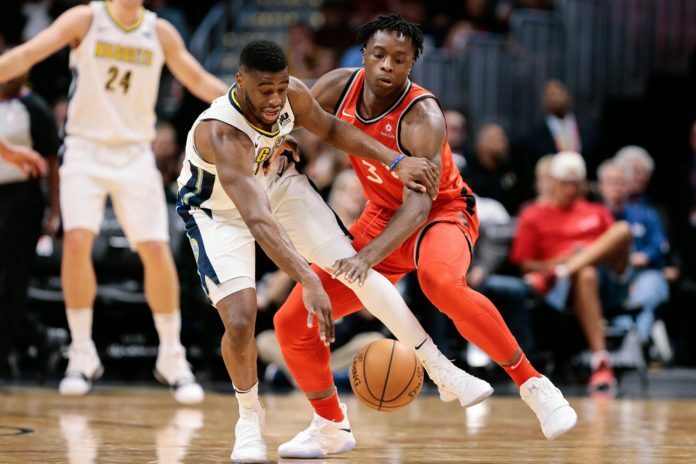 A lack of consistency with his three-point shot, missed opportunities at the rim, and an abundance of inexplicable turnovers has turned Mudiay into one of the more frustrating players to analyze in the entire league. Frustrating isn’t the only appropriate adjective for the Mudiay experience. Enigmatic works just as well because — every now and then — just as you seem to have made your mind up about his game, Mudiay explodes for an exceptional performance. He tantalizes us with breathtaking drives and incredible passes. Mudiay has an uncanny ability to rescue himself from the realm of the unsalvageable. In Denver’s first home game against the new-look Oklahoma City Thunder, Mudiay shined as bright as ever. He dropped 21 points off the bench on 80 percent shooting from the field including a perfect 4-4 from beyond the arc. He also grabbed seven rebounds while dishing out five assists to add to his 21 points on 10 shots. That is ruthless efficiency, and not the type of play that many have come to expect from the young guard. The video above is the good version of Mudiay; talented, but also drenched in an aura of potential and surprise. The good version of Mudiay rarely appears in public. When he does, just the fact that he has graced Denver with his presence alone draws us to him as much as anyone in the room. The bad version Mudiay is nothing like that person. Bad Mudiay makes frequent appearances; hijacking party after party and ruining things for everyone involved. Take the Nuggets’ matchup with the Portland Trail Blazers back on the 13th of November for instance. In just over 21 minutes of action, Mudiay somehow accrued a plus/minus of -29. He only hit one of his four shot attempts and he turned it over three times without recording a single assist. Bad games happen, but this was the product of poor shot selection, failing to value the basketball, and a painfully absent game plan. The first play contains a mid-range jumper that — while uncontested — was the result of a missed catch-and-shoot jump shot opportunity. Once Mudiay passes up the long jumper, Evan Turner went under on the subsequent screen. This was intentional by Turner. Pull-up jump shots are exactly what the defense wants out of Mudiay on that possession. The next play features a one-on-three drive that has no possible explanation beyond a lack of court awareness. Finally, the turnovers; one resulting from another blind drive into the teeth of the defense and another from an entry pass that should never have been attempted. 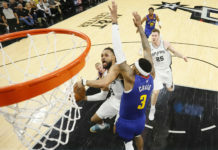 When trying to diagnose the heart of the problem, it is easy to point to poor shot selection and bad turnovers, but those are only symptomatic of a larger problem that has come to define Mudiay’s career thus far: a severe lack of awareness. The most efficient shots in basketball tend to come off of assists, and a catch-and-shoot shot attempt is typically a far more effective than a pull-up jumper. This is fairly intuitive, if not obvious, yet for some reason, Mudiay doesn’t seem to have grasped this concept. 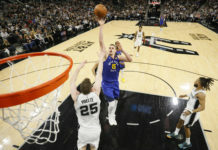 According to NBA.com’s tracking data, 14.6 percent of his shot attempts this season are pull up threes. That’s just too many for a guy who has only connected on a dismal 33 percent of three-point attempts for his career. According to Ben Falk’s Cleaning The Glass, only 77 percent of his made threes come off of assists—this puts him in just the 28th percentile for players of his position type. On this attempt from last season, Mudiay has space for the catch and shoot, but he misses his window. Instead of swinging the ball, he forces the issue by throwing out a jab step and proceeds to take an ill-advised step-back jumper. Going back to the tracking data, Mudiay takes 14.2 percent of his shot attempts this season when ‘open’ from three. ‘Open’ is defined as a shot attempt when defenders are 4-6 feet away. ‘Open’ shots typically sound like a good thing, but Mudiay makes just 30 percent of those attempts. He is the type of player who should really holster that shot unless he is “wide open” — when he hits 50 percent of his shots. To be fair, those shots do make up for a greater percentage of his overall attempts, but 14 percent is far too high of a number for Mudiay, who just cannot hit that shot with any consistency. This becomes especially painful when you consider that Mudiay’s best skill is his athleticism. One can reasonably infer that he would be better served to pump fake defenders in these situations and attack their close out with his speed and strength. Of course, there are reasons for Mudiay’s hesitancy to employ this tactic that goes beyond his lack of awareness. Consider the earlier play from when Denver took on Portland when Turner ducked under the screen that Mudiay was using. The defense is inviting Mudiay to take these shots. Why wouldn’t they give him that look? When Mudiay does get a defender off their feet — or he discovers a potential angle around the defender — it is as if a light bulb goes off in his head, but the thought process seems to stop there. There is no scanning of the defense for potential rotations and virtually zero awareness of how close the opposing team’s bigs are to the basket. Mudiay puts the pedal to the floor — relying on his athleticism to make up for the lack of any game plan whatsoever. When the defense collapses, he either forces the shot or forces a panicked outlet pass. The results are very, very similar. In the 2016-17 season, 67 players drove to the basket 300 or more times. Of those players, only Kent Bazemore, Matthew Dellavedova, and Devin Booker shot a lower percentage from the field when doing so. There are few types of misses that are worse than a point guard blowing a layup at the rim. It leads to devastating fast breaks for opponents and those shots essentially have the same effect as a turnover. This becomes cringe-worthy when you consider that Mudiay also posted the third worst turnover percentage among those 67 players when on the drive. Cleaning the Glass lists Mudiay’s overall turnover percentage at 15.3 percent for that same season. That placed him in the 28th percentile among players designated under the “point” position in Falk’s database. In 555 minutes of play this season, Mudiay’s turnover percentage is even worse. It currently sits at 18.2 percent, good for just the eighth percentile among point players. Here comes the encouraging part: Mudiay is still just 21 years of age. Awareness is the kind of thing that comes with time and experience. Mudiay has some of the physical tools that can’t be taught. In theory, he can turn this thing around. A little more self-awareness and court awareness would go a long way for him. At the same time, this is also Mudiay’s third season in the NBA. He has logged 4085 minutes across 152 games and 107 starts. He’s had time to figure this thing out — or at the very least show signs of improvement — and he hasn’t. The turnover percentage is up from last season, and the assisted rate on his shot attempts has dropped. Plus, he’s shooting just 40 percent on his drives this season. Until Mudiay shows signs of growth in these areas, there is little reason to believe that he will ever blossom into the player Denver desperately wants him to be. The Nuggets haven’t made the playoffs in four seasons and they are itching to end that streak this year. They may be sitting pretty for the time being, but their most brutal stretches of their schedule remain ahead of them. As long as bad Mudiay is the backup point guard, Denver’s playoff hopes are in danger. With little evidence to support consistent appearances from his preferable alter-ego, it may finally be time for Denver to pull out from this investment.